For enjoying meals and conversation, what better place is there other than poolside in your own backyard? Whether it’s a sit-down family barbeque, to a romantic moonlit meal for two, or outdoor bash with several dozen friends and a spread of fun finger foods, sunshine or a starlit sky make private alfresco dining a special experience for everyone. It’s even better with the right mix and type of outdoor tables and seating that accommodates your diners. 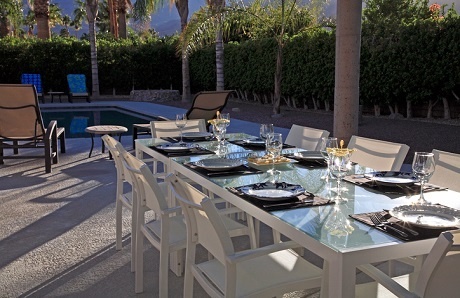 What kinds of poolside dining and outdoor entertaining do you anticipate for your backyard resort? Having a general idea of your family lifestyle and entertainment plans will help make smart furniture selections, so dining experiences are as comfortable and enjoyable as possible. Before you being shopping to deck out your outdoor dining space with tables and chairs, let’s take a look at factors to consider. 1. Determine your style and material preferences. Patio tables and chairs come in a wide variety of designs and materials. Materials, in terms of aesthetics, play a key role in the appearance of furnishings. For patio furniture, the primary materials you will find include wood, plastic, wicker, and metals such as wrought iron and aluminum. Certain metals have powder-coated surfaces for better appearance and comfort. When it comes to dining tables, they may have glass or ceramic tile tops. As for design, consider what fits your aesthetic preferences—much as you would with your indoor furnishings. Think about the general style category that appeals to you: Modern or traditional? Curvy lines or contemporary angles? Plush and upscale or casual and rugged? When creating a space for meals, consider what kind of specific styles and materials best suits your tastes, as well as your backyard setting. Do you prefer wrought-iron scrollwork or rustic wooden country? Does a table with a brightly colored tile top promote the festive ambiance you want to create, or would furnishings made of wicker better compliment your lagoon-style pool and tropical landscaping? Before hitting the store to shop for your patio set, browse online. You can narrow down your preferred styles and favorite kinds of materials. And of course, you may decide to purchase online; just be sure to thoroughly scrutinize the product details to ensure you are getting what you want. 2. Evaluate your needs for maintenance & durability. Outdoor furniture varies in the degree that it will withstand the elements. Materials are the driving factor in the ultimate level of endurance that a table or chair will provide. You want options that can hold up under repeated exposure from local weather, such as rain, heat, humidity, and ultraviolet (UV) sunlight. In parts of the country where the sun is intense, it is particularly key to invest in furniture with UV-resistant fabric and other materials that handle harsh rays. If wind is a factor in your outdoor space, some lightweight materials, such as light plastic or synthetic wicker, may not be suitable. Levels of durability and maintenance vary by material. Even different kinds of wood provide varying amounts of resilience to the elements and require a range of care and upkeep. That makes it vital to look at the pros and cons of the material before making a purchase. For example, plastic comes in a variety of shapes and colors. It’s affordable, simple to clean, and easy to lift and move around if desired. However, a low-cost set of plastic table and chairs may not be appropriate for your patio style or provide the long-term durability you seek. Instead, you might prefer a higher-end—and pricier—marine-grade polymer that’s both stylish and resistant to outdoor elements and heavy use by family and guests. Another consideration: How often will you, your family, and guests move around the placement of your furniture? If items will remain in place most of the year, weight and portability will not be as important as if you plan to rearrange or store your furniture on a regular basis. Don’t forget the surface the furniture will rest on. Consider the ground; will it be a natural grass lawn that may be soft at times? Scratch-resistant concrete pavers? A redwood-plank deck? The kind of surface matters when it comes to considering the furniture material, particularly the feet of the chairs—as diners push them around. Do you want heavy wrought iron chairs getting dragged across your beautiful redwood deck? Another question to consider: Will you frequently combine meals with swimming or spa use? That matters: Imagine the bare skin that may end up directly on the chair seats. For example, a woven wicker chair—with its uneven surface and occasional end pieces that protrude with wear & tear—may leave assorted bumps all over the back of bare legs. On the other hand, synthetic wicker may be more gentle on barely-clad bottoms. Some furniture comes with manufacturer warranties; under the right conditions those guarantees can help protect your investment. 3. Plot out the table types and configurations to serve your needs. Before investing in tables and chairs for your deck or outdoor space, consider where the furniture will go and how much space is available for various pieces, your entertaining style, and who will typically join the meals. How many people will be eating outdoors—regularly? Or only for occasional gatherings? And how will they be dining: Formal sit-down meals with four to eight diners? Or will your guests be mingling and standing much of the time while nibbling on bite-size items without utensils? Will you have adults sipping cocktails or families with kids jumping in and out of the pool and grabbing chips and salsa? With those factors in mind, determine what kind of table and seating arrangements will make the most sense for your backyard and entertaining lifestyle. For example, if you think that sit-down dinners will be frequent, it will be important to buy a table that comfortably accommodates everyone. Estimate approximately 24 inches of space per place setting and between chairs. And if you will be setting out platters of food on the dining table, the table should to be large enough to accommodate place settings plus your serving dishes. If your new dining table will have to fit in a tight outdoor space, or if you prefer a smaller, cozier table, you might opt for another meal-service style. To keep needed tabletop space—and therefore the overall table—size to a minimum, make meals buffet style; serve them up at a nearby spot like an outdoor kitchen, countertop of an island BBQ grill, a temporary folding tabling you set out nearby only when serving outdoor meals, or from your inside kitchen counter or table. For less formal dining and larger parties, consider a series of small tables upon which small plates and drinks can be placed. Tables coming in an enormous variety of colors, shapes, styles, and smaller versions add diversity and create numerous dining spots around the pool and deck. Options include side or “chat” tables, cocktail tables, and low tables (similar to a living room coffee table). Nesting tables, which typically provide three to five multiple small units, save space when not in use but can be taken and spread around the yard when needed. If you plan large gatherings, take a look at including some tall standing tables in the mix. They are ideal for guests to set their food on. In general, they’re also good for scattering throughout your patio and deck areas when you will have many guests and are serving small plates, appetizers, and finger foods. Another strategy is to use a mix of permanent and temporary tables. Buy one or two “main” tables that meet your needs for frequent outdoor dining with your family, and that fit your backyard décor and overall space. Supplement them with other tables that fold or collapse for storage for use when having a bigger event. These additional tables can be very useful for buffets and beverage stations. When narrowing down your table choices, consider the ground surface for the table. Is it uneven? If so, take a look at the table feet; some have adjustable or movable ones that provide greater stability on uneven surfaces. 4. Use a variety of seating options. Outdoor seating options are diverse. Along with dining table chairs, the range includes armchairs, cozy loveseats, benches, barstools for outdoor kitchen with bar tops, chaise lounges around the pool, and couch sectionals for three to 12. Consider if certain seating pieces offer flexibility for different occasions. For example, in a casual pool party where only snacks and drinks will be served, you can move dining-table chairs out from under the table, and spread them around to other spots in the yard. And if needed, chaise lounges—which are designed for people to lie on poolside—can be used by a couple of guests (sitting upright) as they chat and eat finger food. If your family or friends will frequently sit down to outdoor meals, it’s best to have at least one permanent or main seating arrangement—mentioned above—that includes a dining table and chairs. Many can be purchased as sets with matching tables and chairs (or benches). For a dining area that supports easy flow of conversation, surround small tables and low coffee-table-style pieces with a sectional or multiple chairs. To save space or to supplement seating when you are feeding a crowd, buy stacking or folding chairs. Other options for accommodating small plates or casuals bites include stools and benches. For seating that will get frequent use: If the chairs do not have soft bottoms, remember to buy cushions and pillows. Look for those specifically designed for outdoor use that resist water, mildew, and UV rays. With a huge selection of colors, shapes, and patterns available, these textiles can fit your personal style. Add a large outdoor rug to elevate your dining area style to help define the “dining room” space. 5. Consider how to keep cool on sunny days. Keep your family, guests, and food out of direct sunlight by placing your dining table “under cover.” The ideal spot is in a spot where your home, large trees, tall fence, or other structure block some of the sun’s rays. Or, the perfect setting might be a set up under a permanent or semi-permanent shade structure, such as a pergolas gazebo, pavilion, or screen enclosure. However, if you do not have that kind of structure or other shaded backyard spot, outdoor umbrellas provide a good solution. Umbrellas can be either freestanding or integrated into your dining table. Market, garden, and drape umbrellas have a center pole. You can buy a table with a hole in the center for this purpose, and it gives you option to insert—as needed—an umbrella of your choice or the one that may be included with the table. Such a configuration evenly distributes umbrella cover around the table. However, unless the canopy is larger than the table dimensions, the angle of the sun at various times of day may leave some diners more exposed to rays. Keep in mind the center hole and the pole eat up some surface space if your plan to fill up table with serving dishes. The pole can be distracting to conversation as well. On the other hand, cantilever—or offset—umbrellas have a pole outside the canopy. It will take up more space around the table area. However, a key advantage is how you can tilt or rotate the canopy to help block the sun as it moves across the sky. Whether a market or canopy umbrella, to fully shade your dining table buy one that is two feet longer on each side than your table. If you have a six-foot round table, get a 10-foot umbrella. You will want a height that won't get in the way of a standing adult, yet still provides some protection from the sun’s rays. Seven-to-eight foot poles are usually a good bet. You can use freestanding umbrellas to shade smaller dining areas, accent tables, and other seating areas. Fabrics vary, too. The best ones for outdoor use can hold up well with repeated rain and UV rays and are more resistant to fading, stains, and mildew. Look for a heavy, strong base for the pole; you will be happy you have a heavy one when a strong wind blows—especially if you have a food-laden table and guests. Bonus tip: Don’t overlook the umbrella frame material. Common ones are wood, aluminum, steel, and fiberglass. How suitable is the material for local climate and conditions in your backyard? For example, aluminum is lightweight and rust-resistant, while fiberglass bends more easily and is better for windy locations. There’s a certain magic in sharing food in the fresh air, making alfresco dining a treat. Having poolside meals in your own backyard resort is both special and convenient. Make mealtime in your own oasis an ongoing delight by taking the time to match your outdoor furniture to your specific dining needs. It’s easy to wander into a patio furniture store or the summertime outdoor furniture aisle at a big box store and get overwhelmed by all of the offerings. A little planning and design consideration in advance will go a long way in helping you choose wisely so you can create a comfortable, attractive, and delicious experience for family and friends.